Common dolphins have an hourglass pattern of light grey and tan or yellow on their sides and a dark stripe from flipper to lower jaw, with a long well-defined black beak. Calves display the same patterns but are lighter in colour. They can reach lenghts of up to 2.3-2.6 metres. These animals are very social and often travel in enormous pods of more than a thousand. They're known for their high leaps out of the water, and they enjoy riding the bow waves of boats for long periods of time. They are a very energetic and highly vocal species that produce a variety of whistles, pulses, and clicks that are easily heard. They are also known to associate with schools of pilot whales and other dolphin species, they are known to dive to depths of 280 metres in search of prey and hunt cooperatively within schools. Dives can last up to 8 minutes but are usually between 10 seconds and 2 minutes. 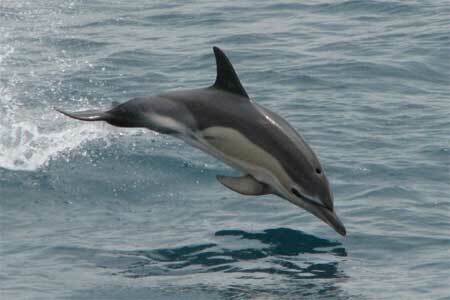 The common dolphin is found in offshore warm-temperate waters in the Atlantic and Pacific and is the most numerous dolphins within this range. 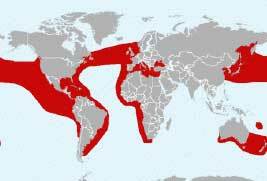 From the graph, we can see that the sightings are similar to the Atlantic Spotted Dolphin.